Cholesterol is converted to bile acids by cholesterol 7 aplha hydroxylase in archaea and human cells. Bile acids can regulate metabolism, neuronal transmission and immunity. Bile acids bind to VDR receptor and downregulate the innate immune response. Bile acid deficiency leads to autoimmune disease. Bile acids bind to FXR receptor increasing glycogenesis, inhibiting gluconeogenesis and inhibiting triglyceride and VLDL synthesis. Thus bile acids can prevent metabolic syndrome x. Bile acids bind to the PXR receptor increasing cholesterol degradation. Blocking the PXR receptor produces cholesterol toxicity. Bile acids bind to TGR 5 receptor converting T4 to T3 and uncouple oxidative phosphorylation. T3 functions as a neurotransmitter in the cerebellar cortex and leads to dominance of unconscious brain function and CCAS. Bile acids also bind to olfactory receptors and stimulate the limbic lobe. Bile acid deficiency can lead to autism and schizophrenia. 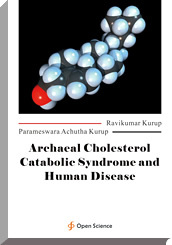 Thus the archaeal cholesterol catabolic syndrome can lead to cholesterol deficiency and bile acid deficiency. CoQ deficiency can lead to an autonomic neuropathy also contributing to metabolic syndrome, psychiatric disorders and autoimmune disease as well as neurodegenerations and malignancy.